In my last post, I described how to set clear expectations in the scope of services section of your proposal. Expectations can be further clarified in the “exclusions” portion, in which you describe to your client what you aren’t going to do. Sounds a little weird in a proposal, right? However, exclusions are just another opportunity to have a conversation with potential clients about their needs and expectations. In the scope of services, you describe what you are going to do for your client. Exclusions list what you won’t do. You do this to address any underlying assumptions a client might have about what the work entails. For example, will you provide traffic control if your project involves working in the street? Are you going to obtain any fee permits? If a boundary turns out to be in a hard-to-reach or potentially dangerous area, will you still mark it? In addition, people often list the hours their workers will be on the job site under exclusions to let clients know they won’t be available at nights or on the weekends. When do you include exclusions? If your scope of services is fairly straightforward or the project is relatively small, you might not need to add exclusions. However, on particularly complicated or in-depth projects, exclusions can help keep the project contained, manageable and profitable. Exclusions are also helpful when you undertake a project that might have unexpected results. Let’s say you provide boundary markings for a new home construction project. Will you be available if there is a boundary dispute? Or if you conduct topographical mapping for a sewer line installation, will you be on-hand if they run into issues and want additional information? Sometimes the exclusion is list is already included in the request for proposal because the client needs to keep costs down. In that case, you don’t need to write you own. However, read those exclusions carefully and make sure they won’t hinder your ability to complete the project up to your standards. How do you include them? Exclusions are prepared in list form with the heading “Exclusions” and attached as an addendum to your proposal. Use clear, concrete language: “Arbitration of boundary disputes,” “Permit fees,” or “Work hours will be industry standard 7:00am-3:30pm unless otherwise agreed upon.” If you work on similar projects, you could prepare a standard list of exclusions to save you time. 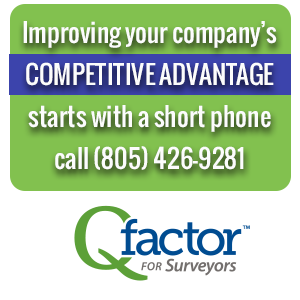 With Qfactor of Land Surveyors, you can attach the exclusions list to your proposal with the other supporting documents from within the proposal builder. Stayed tuned for the next post in my series on building strong proposals: deliverables.